During the last few weeks, the team was busy working on a couple of brand new in-app features designed to help you with your SEO work. Earlier this month we presented at SMXEast our latest CTR study, focused on the impact of blended search on organic click-through rate in 2014. Our analysis is based on 465 thousand keywords across 5 thousand websites, for the month of July 2014, and you can get yourself a full copy of our findings here. However, the study was a general one and there was no direct research aimed at a data analyst looking at his own metrics. 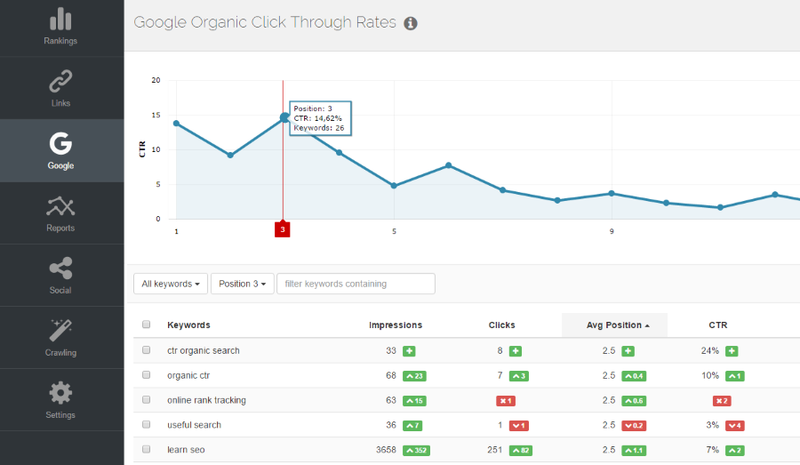 So, the next logical step was to apply the same formulas to individual projects, and allow you to correlate keywords from Google Webmaster Tools, by ranking position, with their impressions, clicks, average position and CTR metrics. To this end, the brand new GWT Statistics feature was designed and added straight into AWR Cloud. The statistic gives a breakdown by average ranking position (from 1 to 20) for the first 1000 search queries from Webmaster Tools. It allows you to easily add keywords into your AWR Cloud projects to start analyzing their full metrics. Algorithm updates are the Big Bad Wolf Google unleashes once in a while. We’ve all been there, dreading how it might affect website performance in SERPs or sudden rankings drop. The time spent analyzing changes can be daunting. By taking AWR Cloud metrics for each individual project and putting them against a timeline of Google Algorithm changes this problem is solved. We calculated the changes from the rankings of approximately 10,000 keywords and 500,000 URLs, across various industries. The data is updated daily and it shows both the number of changes as well as the percentage of the keywords that were affected. Depending on the number and severity of ranking changes, the bar chart color changes from green (fewer changes) to yellow (moderate changes) and red (major changes). The ranking changes show the number of websites that have had their rankings changed and the percentage (how many websites were affected from the total number of websites). 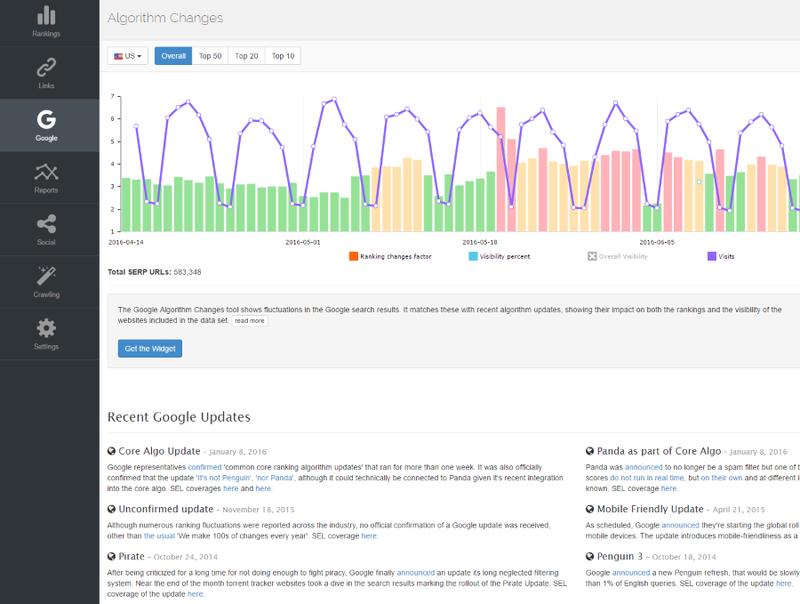 The more websites are affected, the higher the importance of the algorithm update. The timeline goes 6 months back, and we’re likely to expand this time frame as more changes pop up, allowing you to constantly monitor your website’s evolution. By adding the timeline into your AWR Cloud projects, your own rankings changes, your website’s visibility percent trend and website visits can all be linked directly to fluctuations in Google’s behaviour. This is how the feature looks like in-app, so why don’t you login and give it a go? Questions? Drop me a line below and get the conversation started! Author Ade VitanPosted on October 28, 2014 July 13, 2016 Leave a comment on New Features in AWR Cloud: GWT Stats and Algorithm Changes!